What is Chinese Valentines Day? As Auckland becomes so amazingly multi-cultural, I find it fascinating to find out more how other cultures use and celebrate flowers, as part of their annual festivals and celebrations.... I am going in search of more information on Chinese New Year which in 2019 is on 7 August. For the Chinese culture Valentines Day is not celebrated on the 14th February but instead Chinese Valentines Day is celebrated on the 7th Day of the 7th Lunar month after Chinese New Year. Here at Best Blooms, we have noticed this annual celebration of love getting more popular each year and so I wanted to find some more information and to keep our florist team informed. It is called the Double Seventh Day Festival (Qixi festival -Chinese: 七夕節) and has over 2000 years history, stemming from the Han Dynasty (206 BC - 220 AD) The Chinese people celebrate this by giving gifts to each other such as flowers, chocolates or candy and for gifts for the men of ties or watches.It is the most romantic among the Chinese annual festivals and as such is known as Chinese Valentines Day. The main participants are young people - particulary young women who often make wishes for a good husband, worshiping Zhinu the weaver, and show off their domestic skills. One of the most popular customs involve threading a needle under moonlight, which is a long standing means of "pleading skills" (showing off their domestic skills). How Chinese Valentines Day is celebrated today - Now people usually celebrate by giving flowers as opposed to some of the traditional customs - I guess western influence has taken hold. However everyone knows and loves the legend of the young lovers of Niulang and Zhinu and can recite the oral story and keep the romance of the story alive to pass from one generation to the next. It is believed that the Qixi Festival originated from the romantic legend of Niulang the cowherd (牛郎 Niúláng /nyoh-lung/ 'ox youth') and Zhinü the weaver girl (织女 Zhínǚ /jrr-nyoo/ 'brother's daughter / niece (brother's side)'). The legend is popular among Chinese people. Almost everyone knows it, old and young. Legend has it that a young, poor, but kind-hearted cowherd, Niulang, lived with his elder brother after his parents passed away. Unfortunately, both his brother and sister-in-law were cruel and treated him badly. They kicked him out of the house, and all he had in the world were the clothes on his back and an old ox. The ox actually was once the god of cattle in heaven, but was downgraded into the human world as an ox because he had violated the law of heaven. Niulang once saved the ox when it was sick. In order to show its gratitude to Niulang, the old ox helped Niulang get acquainted with Zhinü (a fairy, the seventh daughter of a goddess) when she escaped from her boring life in heaven to look for fun on the earth. Zhinü soon fell in love with Niulang and they got married without the knowledge of the goddess. Niulang and Zhinü lived a happy life together; Niulang worked in the field while Zhinü did weaving at home. After a few years passed, they had two children, one boy and one girl. However, happy times didn't last long; the Goddess of Heaven (Zhinü's mother) found out that Zhinü, a fairy girl, had married a mere mortal. 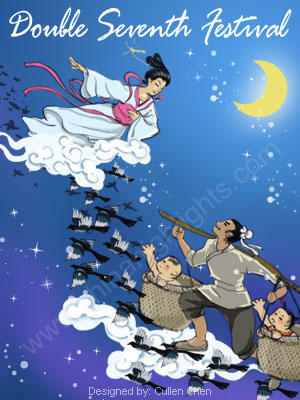 The goddess was furious and sent celestial soldiers to bring Zhinü back. Niulang was very upset when he found his wife was taken back to heaven. Then his ox asked Niulang to kill it and put on its hide, so he would be able to go up to heaven to find his wife. Crying bitterly, he killed the ox, put on the skin, and carried his two beloved children off to Heaven to find Zhinü. Just before he caught up with Zhinü the goddess of heaven took out her hairpin and created a huge river between them, and they were separated forever by the river that later became to be known as the Milky Way. Heartbroken, he and his children could only weep bitterly. However, their love moved all of the magpies in the world to take pity on them, and they flew up into heaven to form a bridge over the river, so Niulang and Zhinü could meet on the magpie bridge. The goddess was also moved by their love, so she allowed them to meet each other on the magpie bridge on that day every year (the seventh day of the seventh lunar month).